So the VERY next episode I'm going to talk about is Threshold and I know we're all really excited about that. But... the last couple days what I did was just watch a bunch of X-Files because once I start it's like I'm a kid again and I just can't stop. Anyway, I've done so much writing work lately that I've been aching to do a little art (that's not work or commissioned... just stuff for myself) and I ended up spending some time in photoshop while Scully got kidnapped by aliens/the government. And of course I had to do a Scully piece. I realize eating a sandwich in the morgue is a huge cliche but whatever, if anyone can pull that off, it's autopsy extraordinaire Doctor Dana Scully, FBI. I have almost no experience with animated gifs but I really wanted Scully to chew her sandwich while the entrails dripped blood so... I made it happen. 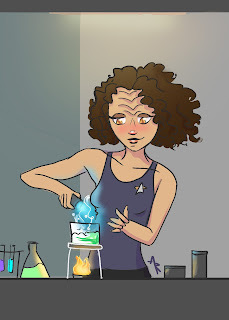 Now I'm thinking about animating B'Elanna up there too. Johnny! I agree with pretty much everything you've said here. I love both Blood Fever and Distant Origin and I love Voyager's handling of The Borg. They're a perfect nemesis for Voyager--which, I agree, is way underrated. I love this crew and this show (obviously) and that's part of why I'm doing what I'm doing this year (even though I'm way behind) because I feel like Voyager doesn't really get enough credit. More than just underrated... I think people resent Voyager for being more exciting than TNG. The biggest complaint I derive from reading any Trek fan feedback is "Voyager used the Borg too much, and defeated them/made it look easy!" When really, what Voyager did exceptionally well, was acknowledge their surroundings and maintain trajectory to examine the psychology of the Borg's motives and behaviour, thus finding more weaknesses than we previously knew (and fight their way all the way home as a solitary, plucky'lil Intrepid ship that gave the Borg a couple of bloody noses on the way.). TNG had high drama with the Borg (and lots of nostalgia) but Voyager showed you the nature of the Queen and the mechanics of the hive.